In this year’s Municipal Equality Index (MEI), 47 out of 408 rated cities across the country earned a 100-point score. 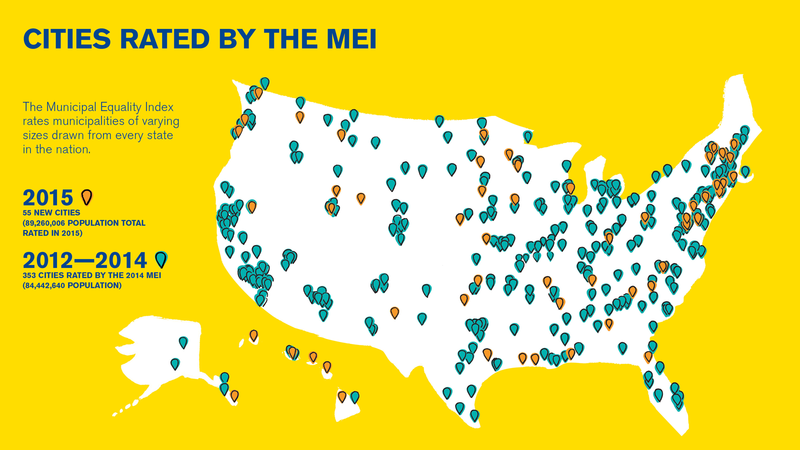 This continues a steady increase over 38 cities in 2014, 25 cities in 2013 and 11 cities in 2012, the first year the MEI was published. Perfect scores are earned by cities with exemplary LGBT policies, ranging from non-discrimination laws and equal employee benefits, to cutting-edge city services and strong relationships with the LGBT community. These cities are proving that they can ensure equality even in states that are lagging behind in enacting LGBT-inclusive laws and policies. MEI examines the laws, policies, and services of municipalities and rates them on the basis of their inclusivity of LGBT people who live and work there.